The values upon which your company is built tell the world what you believe is important and what to expect from you. What makes your company unique or better? I'm going to share with you a powerful, but often ignored strategy that will allow you to attract more of your ideal customers, foster a successful company culture, and grow your business faster. Would that valuable to you? Create, articulate and circulate your company's core values. Everything revolves around values. For example, let’s take our last election and our new President, Donald J. Trump. Whether you love him or hate him, the emotions you're experiencing right now are simply a reflection of your values. Did you happen to watch the Super Bowl and the ensuing media storm that erupted regarding the commercials? Never in the history of the Super Bowl has there been so many companies publicly and openly sharing their values in an effort to let their customers know what they stand for and what they believe in. What do you stand for? What does your company value? If I were to visit your company's About Us area, what would I discover about you and your business? Would I find the typical mundane, resume-style descriptions of the staff? Or would I discover something memorable about your company that could really resonate with me because we share similar values? According to Leadpages.net, the About section is typically one of the four most visited areas of your website. Unfortunately, it's the one area that is typically undervalued and neglected, even treated as an afterthought, by most businesses. When was the last time you spent some time on the About section of your site? See what I mean? Doesn't it make sense to communicate a powerful message about your company's VALUE to the world, by revealing your company's VALUES and how you positively impact your customers lives? According to Verne Harnish, in his book Scaling Up, (which is a MUST read for any entrepreneur), crafting thoughtful and meaningful core value statements are critical to the long-term growth strategy of any company. In the book, Verne tells the story of how CEO Hatim Tyabji grew VeriFone from a $31 million dollar company into a $600 million enterprise in the competitive industry of credit card transactions. Tyabji credits (pun intended) much of that success to his key leadership tool, a nine-page "blue book" that reveals VeriFone's core values. It was ultimately translated into eight languages. He then claims to have "essentially spent the next 11 years repeating myself" to ensure his company adopted these values to grow VeriFone into a global success. That’s the power of living your company’s core values on a consistent basis. If you consider that Zappos sold their business to Amazon for $1.2 BILLION dollars, and the CEO says if he could do ONE thing differently, it would be to create their values at the very beginning, then that should be a sledgehammer of a clue for you to do the same. Rather than trying to teach you how to craft your own core values, I’m going to show you what other successful companies are doing with their core values. Use them for inspiration as you set out to articulate your own company’s core values. 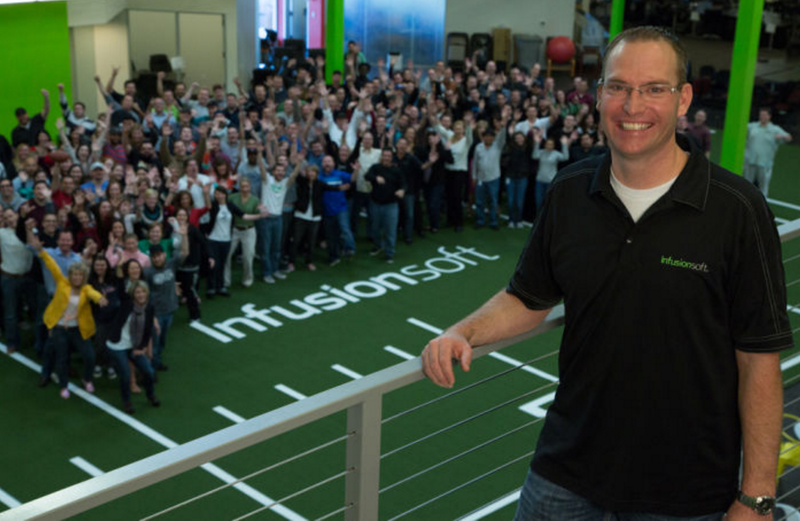 Infusionsoft is an industry leader in the sales and marketing automation space for small to medium-sized businesses. I remember attending a training event at their headquarters in Arizona and their CEO, Clate Mask, made an unannounced appearance. Impromptu, he eloquently and passionately recited their company values from memory... verbatim. You can read them all here. Honestly, it was hard to not be impressed. It would be interesting to know if articulating their core values was a factor in Goldman Sachs’ decision to invest $54 million to solidify Infusionsoft's position as a market leader. Regardless, there is little wonder why Infusionsoft has experienced so much success. Their passion to articulate their values and abiding by them is one of the reasons I've remained a loyal customer all these years, even as the marketing automation space has become extremely competitive. It's also a reason why I make it a point to attend their ICON event each year. The 2017 keynote speaker is the uber-successful Marcus Lemonis, aka The Profit. Do you think Marcus Lemonis would speak at their conference if he didn't know and appreciate Infusionsoft's core values? Digital Marketer is an education company that's on a mission to help 10,000 companies double the size of their business in the next 5 years. How do I know that? It’s on their About page. On this page, they also share their beliefs, which a reflection of their values. However, these beliefs are not written. Instead, they have different team members sharing their beliefs in this engaging video. I love that they're not afraid to be bold, while still adding a sense of levity and humility to their video. They even include some fun photos of themselves in their office on the page. I believe that their current success is an extension of their values and beliefs, and is why thousands of the world's top marketers and entrepreneurs attend their Traffic and Conversion Summit each spring. What if you recorded your team sharing your company's values and beliefs? Do you believe it would help to build a stronger team culture and synergy? Of course, it would. You don't need to professionally produce a video to get started, but hopefully, it inspires you to begin the journey to create your own. GetUWired is an award-winning internet marketing firm dedicated to helping small businesses succeed. I know that because it says so in their mission statement at the top of their Core Values page. They also have an appealing About page which depicts each “Tribe” member in a friendly-professional photo and shows each of them in a fun or playful pose when you hover over their image. Perhaps it’s their commitment to their company values that has helped GetUWired to win prestigious awards like making Entrepreneur’s Top Company Cultures List for Small Businesses in 2015 and 2017 and hitting Georgia Trend Magazine’s Best Places to Work in Georgia list in 2016.
eClincher is emerging as a powerful player in the social media world and offers a comprehensive, yet intuitive, social media management and marketing dashboard that integrates with all the major social networks, including Instagram. eClincher values transparency, communication, and creating value for their customers. Having worked with them before, I can attest to the fact that each of their employees live these three values daily. Here's just three benefits of creating, articulating and circulating your own company values. When I consult with prospective new clients, I always ask them, "What's your USP?" (Unique Selling Proposition) and "How are you better or different from the competition?" Unfortunately, it's usually a canned response like, "We offer the best product in the marketplace" or "We offer the best customer care in the industry." It's you, your values and your company's values! Your values help define who you are as a person and as a business. They communicate your authenticity and uniqueness. Articulating your company’s values will differentiate you from your competitors. Doing so instills confidence and trust in your customers to want to buy from you and will foster longer relationships with your brand. A great example of this was when my wife and I decided to buy a new mattress. The mattress industry has become wildly competitive recently with new direct-to-consumer companies bypassing traditional retail store distribution. After researching the competition, we chose to buy a Leesa mattress, as Leesa makes it perfectly clear about being a social enterprise here. They've even become a certified B Corporation. Leesa’s rise to success shows that your values and your beliefs as a company matter. People are attracted to values that resemble their own, and your company’s clearly articulated core values or lack thereof can be the difference between converting new customers or losing them to your competition. Remember, the price of your product and your ability to sell your product is directly related to the perceived value in the mind of the consumer. Have you ever purchased a product or service that you knew could be purchased for less money, but you were willing to spend more because of the company's values or social mission? I hope so, because if you don't stand up for what you believe, why should anyone buy from you? Related: The Key to Rapid Scale? Authentic Core Values. One of the biggest challenges facing every entrepreneur is finding the right talent to help grow your company. In fact, it's such a headache for most entrepreneurs, myself included, that I recently created an effective system to instantly filter out lazy, unmotivated people. Of course, you don't want a bunch of "yes" people or clones surrounding you, but you do want to attract people with similar values or people who respect your values. Include your company values in your job listings, and you'll attract the people you want into your business. It may sound too simple to work, but that’s exactly why it does work. Do you want your team to get excited about your business? Here's a great team building exercise. Invite them to a meeting, ideally in a venue outside of your office, so it's relaxed and informal. Begin by asking them what their personal values are, so you can deepen your connection with them and get them to talk freely. Otherwise, if you ask for suggestions on your company values immediately, they may just offer ideas based on what you want to hear… not what they think they truly should be. As they open up and share their personal values, invite them to contribute to the company's value statements. This will hopefully give them a sense of purpose and ownership by including them in the process. Ideally, most of your team will be inspired and will enhance your company's culture. If some of them are indifferent, it can be a good indicator of their current morale and whether they're truly committed to their future at your company… or not. This is an exercise that should be done at least once a year, as your company grows and your team evolves. When your team is in alignment with your company's values, it empowers them to make decisions faster and with ease. This will free your time to be more productive as a company and cultivates strong leadership skills for everyone, including you. Even if you're a solopreneur, it all starts with you. If you neglect this now, someone else will come into your world and impose their values upon you and your business. Are you willing to take that risk? I challenge you to gather your team together and craft your company's own values and belief statements. Then post them in the About area of your website and on your homepage, like we've done here at BizFamous™. Share them on your social media channels. Share them in your email marketing. Doing so will enable you to authentically connect with your ideal audience, attract new leads, and win more business. Most importantly, share your values openly with your clients, customers, and partners… and then invite them to share their values with you. You'll deepen the bond of your existing relationships when you express your values in a meaningful way. As an example, my #1 personal value and our #1 company value is freedom. We cannot succeed as entrepreneurs without freedom.